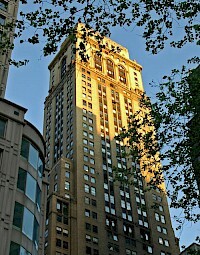 10 East 40th Street or the Mercantile Building is a skyscraper located in the Murray Hill section of New York City, between Fifth Avenue and Madison Avenue, taking the width of the block between 40th and 39th Streets. Designed by Ludlow & Peabody and built by Jesse H. Jones, it was finished in 1929 and is considered part of the art deco school of architecture. When it was built, it was the fourth-tallest tower in the world. 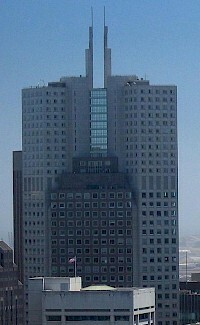 101 California Street is a 48-storey office building completed in 1982 in the Financial District of San Francisco, California. 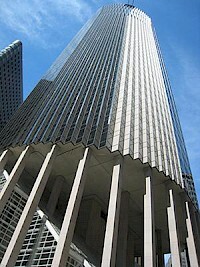 The 183 m (600 ft) tower providing 1,200,000 sq ft (111,000 m) of office space is bounded by California-, Davis-, Front-, and Pine Streets near Market Street. 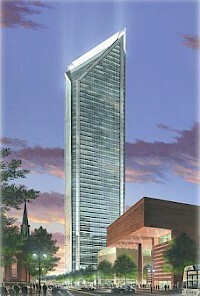 The faceted cylindrical tower features a seven story, glass enclosed lobby and a granite plaza with flower beds and a fountain. 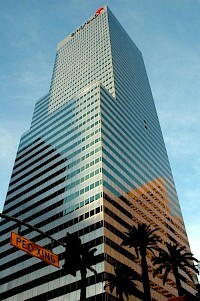 1027 Wilshire Boulevard is an approved 607ft (185m) tall skyscraper in Los Angeles, California. 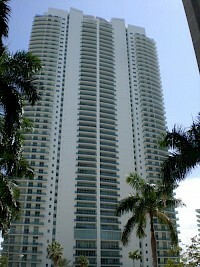 It will be completed in 2010 and has 48 floors. 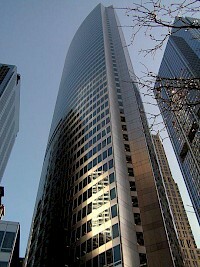 345 California Center is a 48 story office tower located in the heart of the San Francisco financial district. 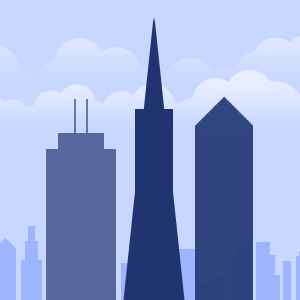 Completed in 1986, the 211.8 m (695 ft) tower is the third-tallest in the city after the Transamerica Pyramid and 555 California Street, and was originally proposed at 30 m (98 ft) taller. 345 California is located in the middle of a block with four historic buildings on each of the four corners. 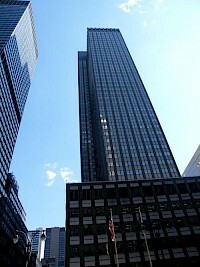 The Condé Nast Building, officially 4 Times Square, is a modern skyscraper in Times Square in Midtown Manhattan. Located on Broadway between 42nd Street and 43rd, the structure was finished in January 2000 as part of a larger project to redevelop 42nd Street. The building stretches 48 stories to 809 ft (247 m) making it the 12th tallest building in New York City and the 41st tallest in the United States.